A celebration of summer, sunshine and food growing in your school playground. Plant a seed, and watch your school garden grow. Then share a delicious home-grown lunch with your friends, school and community – on your very own School Summer Picnic Day! Learn how to grow, cook and prepare home-made dips, sandwiches, salads, and desserts – packed full of nature’s goodness. A picnic feast for the whole community. Start growing for your summer picnic with free seeds! Download the Grow Your Own Picnic pack above then claim your free organic salad mix seeds by clicking here (for London schools only, while supplies last). If you're looking for activities to do with your salad once it's grown, try these ideas. The first 30 schools will also receive a unique variety of seeds from Garden Organic's Heritage Seed Library. 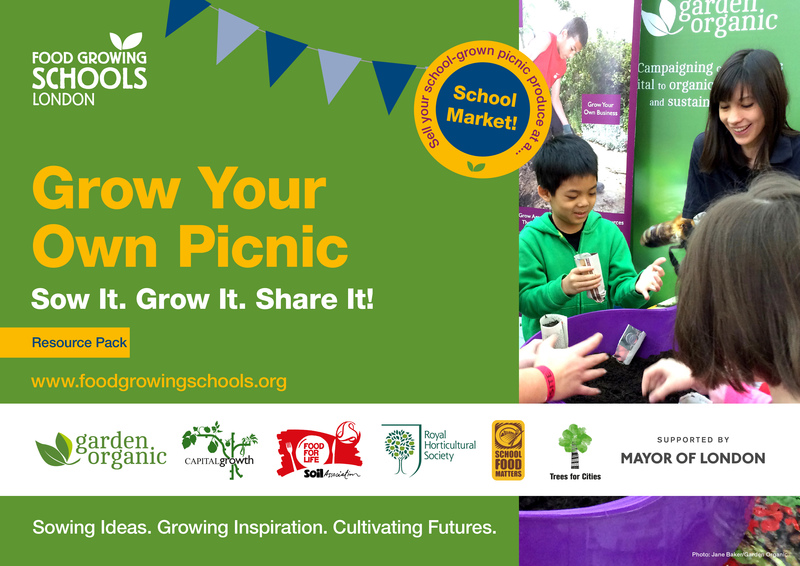 Don't forget to keep us posted on your growing progress this spring with photos and tweets using #GrowYourOwnPicnic @FoodGrowSchools and take a look at this great opportunity to win a £500 voucher to GardenSite.co.uk - details here. Would you also like a free Garden Organic Term Time Garden Planner to help you decide what to plant and when to plant it in time for the end of summer term? Complete our schools survey here and we'll send one to your school. Harvestometer - how much is your picnic worth? Potato Salad - recipe and growing tips for potatoes and parsley. Broad Bean Dip - recipe and growing tips for broad beans and dill. Crudites - serving and growing tips for carrots, radishes and sugar snap peas. Herb bread - recipe and growing tips for chives, rosemary, thyme. Sandwich fillings - sandwich ideas and growing tips for pea shoots, salad leaves, cress. Dessert - strawberry and oat meal muffins, fruit ice cubes and lollies. Grow strawberries, blueberries and edible flower petals. Join in the schools conversation and win prizes! Any data that you provide us will be held in accordance with the 1998 Data Protection Act. The information you have provided will be used by Garden Organic and Food Growing Schools: London for the purposes of administering the Food Growing Schools: London initiative. Some limited personal information may be passed on to third party Garden Site for consideration in selecting a winner for the Garden Site £500 voucher prize. Garden Site will not share your personal information with any other parties. In order to administer the project Garden Organic and/or Food Growing Schools: London may contact you either by email, telephone or post. Please note that without your consent to process your information we may not be able to contact you or involve you in some aspects of the initiative. Please note you are entitled to withdraw your consent to processing your data either for administering the project and/or providing you with information about food growing and related projects/activities at any time by emailing fgslondon@gardenorganic.org.uk with your updated preferences, calling 0247 621 7747, or in writing by letter sent to Garden Organic, Ryton Gardens, Wolston Lane, Coventry, CV8 3LG.